The best reason to scale up is a limited amount of time you can dedicate to brewing. It helps greatly if you have some tried and true recipes dialed in. For example, if you brew a pale ale you really like — and will happily drink 10 gallons (38 L) of it over the next several months without getting tired of it — scaling up makes sense if you can’t schedule many brewdays during that period. Scaling up also makes sense if you brew with a partner and want to split the output. In addition, if you periodically brew for special events in which lots of beer will be consumed, being able to brew larger batches comes in handy. 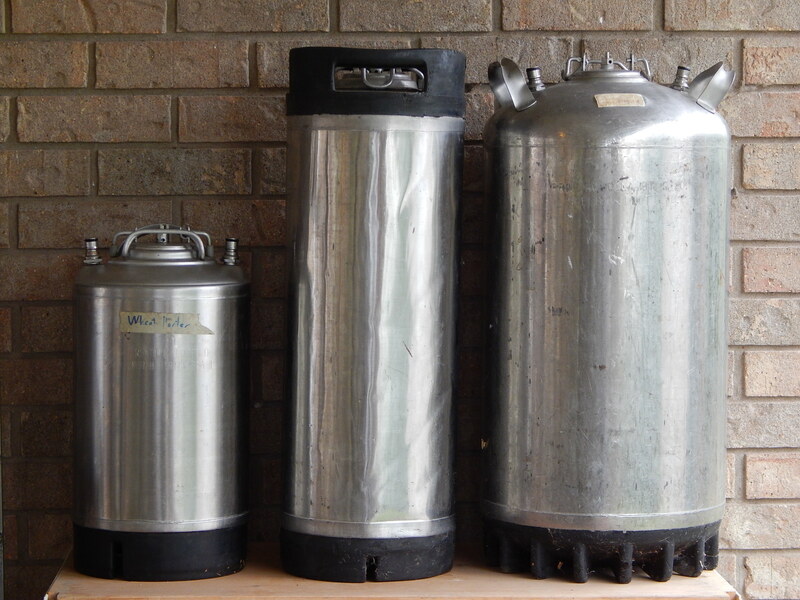 My 10-gallon (38-L) “brewing sculpture,” featuring three 15-gallon (57-L) stainless steel pots as the basis for the HLT, mash/lauter tun, and kettle. The biggest deterrent to scaling up is economically assembling (or purchasing) a collection of vessels and equipment to brew at this scale. Generally, you’ll need a setup designed to make a larger volume of beer. There are a couple ways to squeeze more volume from your existing brewery — high-gravity brewing and extreme wort dilution. These can work well within the confines of their limitations; but in general, if you want to brew larger batches of beer, you’ll need a bigger brewery. In this regard, sometimes you can make do with a situation that isn’t optimal, but that’s acceptable — for example, fermenting in two 6.0-gallon (23-L) carboys instead one one big fermenter, or packaging the beer in two 5.0-gallon (19-L) Corny kegs instead of a single keg. In other cases, a more satisfying solution might be found. I’ll cover all these topics in more depth in my upcoming article on scaling up to 10 gallon (~40 L) batches. There are several instances when scaling down might be a good solution. Obviously, if your physical space precludes easily brewing 5.0-gallon (19-L) batches, scaling down might benefit you. Brewing all-grain batches typically takes more space than extract-based brews. Many apartment brewers have scaled down to 2 or 3 gallons (8–11 L) and never looked back. Scaling down may also be advisable when brewing test batches, or beers with an expensive ingredient list. When brewing very big beers, scaling down may allow all the grain to fit in your mash tun without resorting to a thick mash. If you brew multiple beers for homebrew contests, you can scale to the amount of beers you’ll need. Finally, if you simply brew often enough that homebrew is piling up, scaling down may be the answer. The equipment for a workable 3-gallon (11-L) all-grain brewery. It easily fits on a kitchen countertop and stovetop. 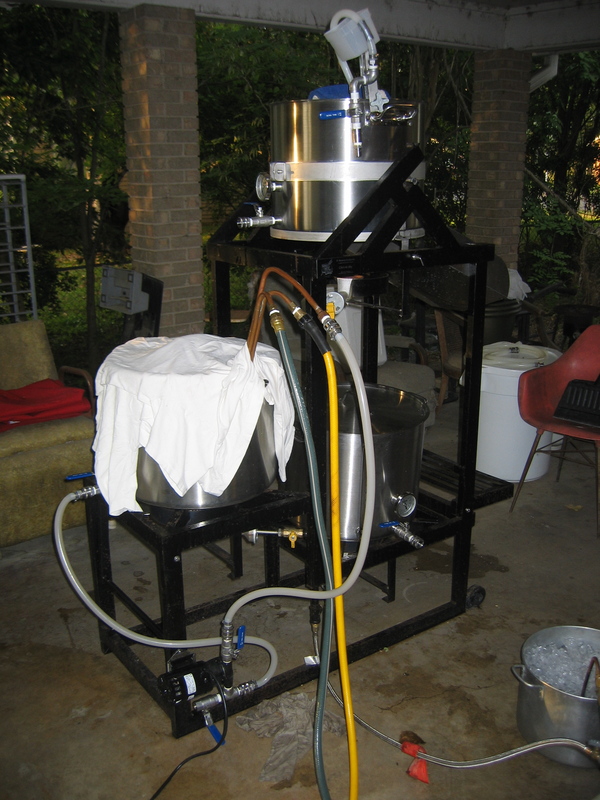 If you have a working 5-gallon (19-L) brewery, scaling down does not require any change in equipment. However, if you’re scaling down for size purposes — for example, if you’ve moved into an apartment — you may want to consider this. Keep in mind that most homebrew shops sell 3.0-gallon (11-L) carboys as well as 5.0-gallon (19-L) buckets and carboys. 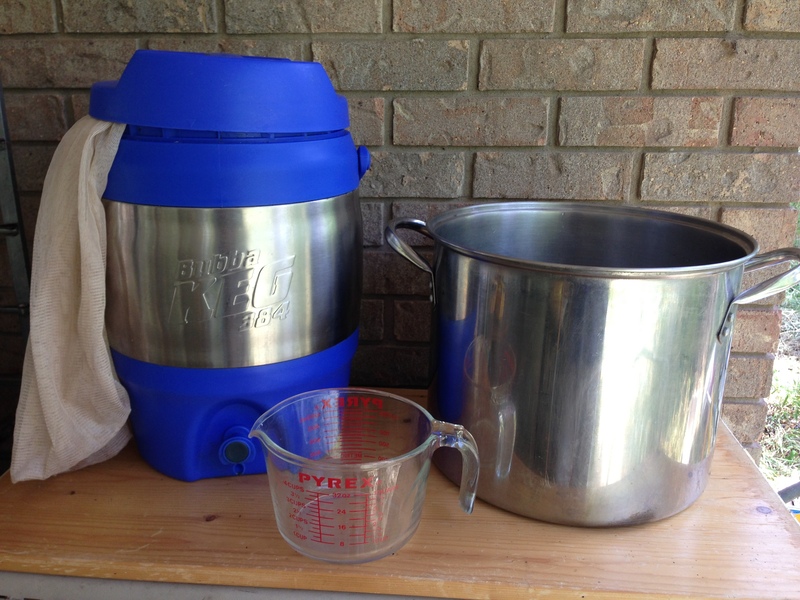 You can easily ferment in a 5.0-gallon (19-L) fermenter and — if you condition your beer in a second vessel — use the 3.0-gallon (11-L) carboy for that. A 3.0-gallon (11-L) or 5.0-gallon (19-L) beverage cooler can work as a mash/lauter tun and still fit on your kitchen’s countertop, and of course, finding a small pot for your kettle should be no problem. Scaling down actually has a host of potential incidental benefits, I’ll discuss all the changes in more depth in my article on scaling down to 2 or 3 gallon (8–11 L) batches. The downside is, of course, you’ll put in the same amount of effort on brewday, but have less beer to show for it. When scaling a homebrew recipe within a reasonable range of homebrew volumes, all the ingredients scale linearly. For example, to scale a 5.0-gallon (19-L) recipe to any size, multiply the amount of each malt by the new batch size (in gallons or L), then divide each by 5.0 gallons or 19 L as appropriate. For example, if a 5-gallon recipe calls for 13 oz. of roasted barley, and you want to brew 3 gallons of it, multiply the grain weight by 3 gallons (giving you 39 oz.-gallons) and then divide by 5 gallons (giving you 7.8 oz.). Scale the amount of hops the same way. If the recipe recommends a yeast starter volume, scale it in this manner. (If it doesn’t use a pitching rate calculator, such as the one at Mr. Malty.) The amount of water you use will roughly scale this way, but may change due to changes in equipment. I’ll discuss little differences in procedures in the two articles (scaling up and scaling down) that accompany this. How Often Should You Brew in 2014? There are a lot of good brew recipe sites that will scale up or down for your amounts from any original recipe amount. I’ve used Brewers Friend with excellent results. AAARRRGGGHHH! Why are you just telling me that Brewer’s Friend this option now!? !